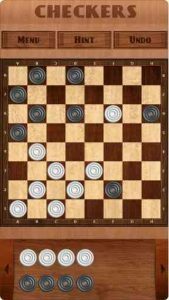 Checkers (also called “Draughts”) is challenging board game that is easy to learn but hard to master. The rules are simple: capture all enemy pieces and win the game! You can play with family and friends or against computer opponent with different difficulty levels. I don’t know why, but I literally play this ‘stupid game’ every day since I started playing a year ago. It is challenging for me, having started out as a complete novice to checkers. I now find it most challenging on the second-highest difficulty setting as the highest difficulty setting is actually easier to beat. I wish the clock still displayed on my phone during the game because I lose track of time. It’s a well-designed game, I must say, that can actually teach you how to be a good player with hints and continue to be challenging. It has ads after every other game and there is no option to pay for ad-free that I can find; I actually would drop $3 or so for an ad free version because I play it so much in my free time. It is definitely worth the download compared to anything else available. Well even though there are some unfortunate things this game is okay. But my complaint is that if you have a jump then it practically makes you jump your opponent . The reason this annoys me is because I could either move forward to the right or jump my opponent to the left but because I could jump him the game wouldn’t let me move forward without jumping him. And the reason I didn’t want to jump him was because I would just get jumped back. And that caused me to lose the game . And although there are other games to play , when I want to play checkers on my phone , I want it to work. Other than this minor problem I think this game serves its purpose and I would recommend it.